In basic 15 wide floor profiles. Cargo Floor has developed an alternative moving floor to ensure that the system is even lighter in a responsible manner. This concerns a sliding floor that has 15 moving floor profiles instead of the usual 21; the total moving floor area has remained the same. This moving floor system is unsuitable for the loading and unloading of pallets and paper rolls when using the sliding operation of the Cargo Floor system because the floor profiles linked to the Cargo Bulkmover concept are wider than the standard 21 plank model. Pallets, etc. can, obviously, be loaded and unloaded appropriately by moving a hand pallet or forklift truck over the floor. More than 20 years of experience with wide floor profiles in mainly stationary factory applications has shown that the 15 plank Bulkmover variant of the Cargo Floor system is extremely suitable for the efficient unloading of most bulk products in large volumes. Weight advantage on the entire trailer depending on the version: this will amount to at least 50 to 300 kg. 30% fewer seams between the floor profiles and therefore leaks and wear will substantially decrease. 30% less installation time of the subdeck structure, floor profiles and guides. Increased stability of the floor profiles because of the Cargo Twister wide bearing with a very wide guide area and support on 3 points. The floor width is identical to the standard 21 plank model. The side profile does not need to be adjusted. 30% less sealing between the floor profiles and, in addition, the sealing is very well protected from the product to be transported. Very large bearing area and therefore less wear. All hydraulic components, cylinders and valves are identical to the ones of the CF500 SLC 21-plank system . Also very suitable for the Power Speed model. Unloading in approximately 3 minutes (ask about the conditions). 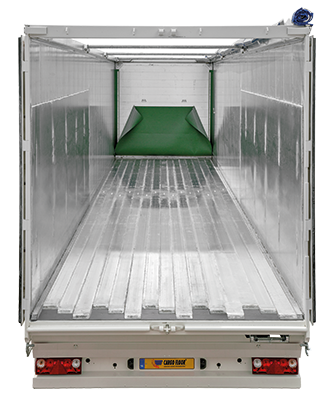 Various floor profiles are available included a special HD and ultimate XHDI model for the transport of all types of waste including glass, sand, etc. It can now also be supplied in the XD hard alloy aluminium model! Suitable for all Cargo Floor drive unit types. Larger bearing and sliding area of the Twister wide 40/25 (+7%). The bearing will not come in contact with the product to be transported in any way (no additional wear) and is protected by the floor profile against splashing road dirt. 30% less labour in relation to any floor overhaul and turning the floor is a lot easier. Absolute lower ‘cost of ownership’. Pallets, paper rolls, etc. : they must only be loaded/unloaded using a forklift truck and hand pallet truck. A special bearing has been developed to ensure sufficient stability and load bearing based on the patented Cargo Twister principle. This continues to guarantee fast and simple installation without having to use tools. The additional advantage of the Cargo Bulkmover is the fact that no fewer than 30% less bearings need to be installed. This Cargo Twister Wide 40/25 bearing is characterised by its width and large bearing area. The Cargo Twister wide 40/25 also has 2 virtually integrated tubes that provide even more stability on both sides of the bearing. The subdeck is built up from 15 tubes that measure 40 x 25 x 2 mm (this is not part of the Cargo Floor delivery scope) that guarantees the stability of the semitrailer structure as well as the support of the bearing. The ‘Cargo Twister wide 40/25’ is installed on this 40 x 25 tube at every intersection of the crossbeam. In addition to the Cargo Twister wide, we have developed a Special wide bearing 40/25 that can be installed optimally as an additional bearing and support between the Twister wide bearings on the 40/25 tube. This Cargo Special wide bearing can also be used in the reverse position as an anti-lifting facility to stop any possible lifting of the floor profiles.